I realized not too long ago that it is important to my practice to eat more local. I am bound to this part of Colorado, and it is bound to me, through my agreements with the local spirits. If it is the land I am called to and connected to, it seems logical that it would be the source of my food, that I would eat food grown in and on the same soil I am now planted in. There are several caveats that make this important. First, those that work the land feed the land, so it's important that I support them doing so as much as possible. Helping support local agriculture helps the land, and I have sworn to help the land of this area as my abilities and opportunities allow. In supporting local agriculture, be it produce or meat or anything else, I am aiding in the process that feeds and strengthens the land. Second, is a concept I've recently come to. The bedrock and foundation of an area breaks down into dirt. Hardy plants that don't need much grow in that dirt, and are built from that dirt. They are of the stuff of that dirt, so of the stuff of the bedrock and foundation. As they live and as they die, they add nutrients to the dirt, as the process of life changes what is taken in into something else. The end process of growth, life, death, and decay is that the dirt becomes soil, able to support plants that need more than those initial plants. These new plants grow, made of the stuff of the soil, which is made of the stuff of the early plants, which is made of the dirt, which is made of the bedrock and foundation. And these plants grow and live and die and decay as well, adding to the soil. And animals eat the plants, and grow and live and die and decay, adding to the soil. And other animals eat them, and so on. All things in the area are essentially made of the stuff of the bedrock and foundation, and part of the spirit of it. This means, if I eat mostly stuff from other parts of the world or country or region or state, I am becoming part of those areas, but the more I eat local, the more of me is local and the stuff of the bedrock and foundation. By eating local, I become more and more part of the land. Third, the money I spend on what I eat stays in the local economy. While I have no problem supporting farmers or ranchers in any part of the country, my priority needs to be here, and as much of my money that can stay in the local economy, the more I support the local economy, which is a major part of the human aspect of what I am committed to. Fourth, local food is fresher and better for me. Because it doesn't have to be shipped as far, it doesn't sit as long, so is closer to how it is fresh off the plant or right after slaughter. If it is shipped across the country or world, it doesn't just sit longer, but has to be harvested or slaughtered with the distance in mind. This means fruits and vegetables have to be picked before they are ripe, so that by the time they get to me, they have ripened to the expected point, not past it. Who would buy over ripe fruits or vegetables? But anyone who has grown their own or got them fresh knows that vine or plant ripened tastes better than shelf ripened. Meat has similar issues, as it has to be kept cold or frozen to ship it, and sits longer. This increases the health risk of bacteria, and decreases the taste. And I have no idea what happens for sure during those trips, or what the growing conditions were. There are other reasons as well, but I'll leave it at those four. I started with honey, as I already knew I could get Clark's honey at Sprout's, a health food chain. Clark's honey comes from Fort Luptin, on the eastern edge of the area I call home, and definitely local. I got a bottle of their wildflower honey, which is quite strong in taste compared to most honey, and made from the nectar gathered from local wildflowers by the bees. I add honey to a lot of things instead of sugar, and quite often eat it in peanut butter on a spoon, so it seemed a good place to start. A few days later, I did checking at the local grocery store chains. I was told they all have local suppliers, so I figured I'd check what they had. I started with Sprouts. I figured a chain that totes being health food and has organic and similar type products would also have a lot of local food as well. Wrong. The only thing I could find that was local was Clark's honey. There was a pamphlet for a local beef farm in Northglenn, but none of the meat had any labels saying that farm's name, and the only labels on them gave country names (I saw United States, Uruguay, and I thin Ecuador). I asked one of the people at the butcher counter, and he said he has no idea where the meat is from beyond what's on the label, that they aren't told where anything is produced or grown. Maybe some of it is local, but they have no idea which, if any. Not helpful. At Safeway, I had a little better luck. I found a few items in the produce section marked as Colorado grown, and a fair amount of meat marked as such. I talked to a person in the produce section, and while they try to mark the fruits and vegetables, they are only required to give the country of origin, not any more specific. He said there is other local produce, unmarked, but he wasn't sure which. Also, there was no method to determine if it was truly local or from a different part of the state. Local just meant somewhere in Colorado. More helpful, but not enough. King Soopers was better. They had a lot of local produce, and they label everything that is from Colorado with Colorado Proud. In addition, almost all the produce that is from Colorado doesn't just have that, but a sign giving the town it's from. Unfortunately, almost all of these were outside the Northern Frontrange area. Meat is also always marked, but sparse. I've only ever seen one or two items at a time, if that. Safeway has much more. Walmart uses Colorado Proud labels, as well, but had very few items. Target, for meat, only had sausage. For produce, they had one end cap of local vegetables, good stuff but not much. So, basically, for grocery store chains, at least in this area, King Soopers seems best for local produce and Safeway for local meat. But neither completely fit what I was looking for. I decided that it would be better buying straight from the producers. I figured the farmer's market was the best place to go to identify which producers I could contact. I have been used to the farmer's market in Laramie. It lasts for three months, from the first Friday of July to the last Friday of September. It is only on Fridays, and only for two hours each Friday. I was surprised to find that Longmont's farmer's market lasts from the first Saturday of April to the first Saturday of November, seven months. In addition, it is from 8 a.m. to 1 p.m. every Saturday, five hours instead of two. Boulder's farmer's market is even longer, covering the same span but 8 a.m. to 2 p.m., and having a second time, from May until October on Wednesdays from 4 p.m. to 8 p.m. Quite impressive times for both compared to Laramie. That Saturday, I went down the the farmer's market in Longmont, which occurs in the Boulder County Fair Grounds. These grounds are huge compared to any county fairgrounds I have seen in Wyoming. It seemed odd to me at first that the county fair grounds would not be in the county seat. I found a sign that told the history, and found out it started out in Boulder, but the county fair grew so big, they looked for a larger location and it moved to Longmont. Thinking about the county, I realised this makes sense on another level. While Boulder is definitely the political and administrative heart of the county, Longmont is definitely the agricultural heart. Boulder started as a gold mining town, and the hills above and Boulder Creek define it. From there, it grew into a university town and the administrative centre. Longmont began life as a farming town, with the Chicago-Colorado Colony. When the railroad came through, it became the place crops were loaded onto the train, so all the grain and produce came into Longmont. It's never fully lost that character. County fairs, at least in the Mountain West, are primarily agricultural fairs. So the location of the fair grounds makes a lot of sense. The day I decided to go to the farmer's market was the day of the 4H Fair. There were a lot of people everywhere. I finally found the farmer's market on the northern end of the grounds. It was quite a bit larger than Laramie's, at least in number of stalls. Everything was packed close together, each stall touching, unlike Laramie's where there is typically a fair amount of space between. But it covered almost the same area total. There was a lot of local farms and ranches represented. I walked through, talked to a fair number of them, got business cards and pamphlet, and bought a bag of basil. 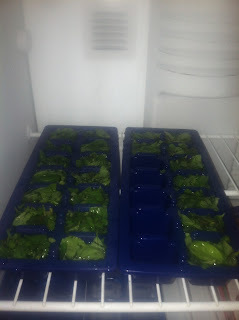 It was a lot more fresh basil for only $2 than I had spent $4 for in the store, and fresher and stronger. Pleased with my purchase and the literature I had collected, I went home. I used the basil that night to make bruschetta. I had had everything I needed for it, but had waited too long and the basil had gone bad. This basil was better basil, cheaper, and local, grown in local soil by locals. the rest of the meal wasn't local, but it was a step. It was a lot of basil, so I had a lot left. I cut it up and put it in ice cube trays and added water and froze it. Little basil cubes, perfect for dropping in sauce or soup. No good for things like bruschetta, but available for most other applications without the fear of it going bad. After it was froze, I popped them out and put them in a zip lock bag in the freezer. The next Friday, I decided to go visit some places. The person I bought the basil from had said to come by the farm, Frog Belly Farm, sometime, so I decided to start there. I got out there and it was a beautiful area. There was a field near the gate with a sign saying Parking, so I parked there and walked the rest of the way in. I was amused to see a pepper plant growing beside the road, obviously a volunteer, likely from a pepper that fell off a truck, or similar. I talked briefly with a lady who seemed to be the crew chief or similar and she said to go ahead and wander around and see what they do. They have several areas of rows of vegetables, several greenhouses, a potting area, a barn and other buildings, a corral with swine in it, and likely other things in areas I didn't see. People were weeding and picking, and there were tractors that were doing something near the barn. Over all, a nice looking farm, well run, well organized. Only thing I saw that my grandpa who was a farmer would have taken issue with was there was a lot of morning glory entwining many plants. He hated the stuff, because once it got into a field it was very hard to remove. One thing I really loved was a domed greenhouse with herbs growing inside. What I wouldn't give for a greenhouse like that for herbs! It was interesting walking on soil that has been worked for a long time, soil producing food, grown locally and and in local soil. There is power in that, and I could feel it in the land. This was living land, land that partnered with the people that worked it. Walking that land and feeling it was a treat. After I finished wandering and looking, I talked to the woman I had at the beginning again. I asked her about buying, and found out it's a CSA farm, that they were preparing for the delivery to their share holders. They sell at market what doesn't go to the holders, and sometimes sell at the farm if there's excess. So I found out going out there wasn't the best way to buy. From there, I drove toward a cattle ranch. It was out near Hygiene, I forget the exact name. It sells grass fed beef. When I got there, there was a mailbox with the address, but no sign advertising it, and a cattle gate closed at the road in. This isn't abnormal for a ranch, but the lack of a sign made me second guess if it was a place to visit. I drove by, then pulled over and parked a bit up the road and pulled up their website. It did talk about coming by, but when I looked at the prices, it was talking price per pound and weights in the 500 pond range, and telling what size freezer is needed for that. I realised buying there would require buying much larger bulk than I could use, so buying there wasn't the best way either. I got out of the car and walked back up the road. The ranch was separated from the road by a creek. I took a look at it, and thought about the fact that this was definitely a cattle ranch, not a cattle farm. I've mused about this, and talked about ti to a couple people including a friend who grew up on a ranch. My grandpa was a farmer. When i was a kid, he lived on and worked a cattle farm. It felt like a farm. Grass fed, not feed lot, pasture and grazing, but definitely a farm. My friend's family ranch feels like a ranch to me, not like a farm, and this one I went to visit also did. So what's the difference? I came to the conclusion that a farm is cultivated and set, domesticated, whereas a ranch is more wild, more changing. My grandpa's farm was four sections, one with the house, outbuildings, containerizes, barns, sheds, and corrals, one with barley growing, one with hay growing, and one for grazing. I believe he rotated the three without buildings. The cattle were let out into the pasture to graze, but typically spent the night in the corral, in the three sided sheds that backed it. When they were fed hay or oats, it was in feeding troughs build into the corral fence. The ranches I've been on, the cattle spend the night in the field, or in open range, not corrals and sheds. Hay is brought out and given in the field, not in troughs. The only crop besides cattle is hay to feed the cattle. Quite a bit different, and the land feels different. A ranch, the land feels wild, barely different from open range. The land on a farm feels domesticated, working with the farmer, but farmland, defined, set. As I drove back to town, I thought of what I had seen and learned. I realised the farmer's market was the best bet for local produce and meat, and realised that in times before refrigeration, you likely bought food at a market when you needed it, and that farmers would bring things in to the town where people would buy it. A much different system than we have today, at least in this part of the world with supermarkets and grocery store chains. And everything would have been local, or most everything. The farmer's market was exactly what I needed and where I needed to find local food items. The next day, on Saturday, I went to the farmer's market with the intent to make a meal. I started with meat, looking at what was available and the prices, as more expensive meat would limit the produce I could buy to use with it. I settled on lamb shanks. In addition, I bought garlic, a yellow onion, rosemary, and shiitake and oyster mushrooms. Total came to about $18. The Monday night, I made it. 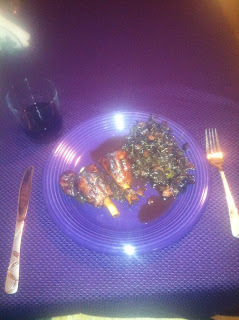 I seared the lamb shanks in olive oil. While it was searing, I browned the complete head of local garlic in olive oil, chopped up and added a whole local yellow onion, an Anaheim pepper and a jalapeño pepper (both non-local), a large pinch of local rosemary, and almost half a bottle of red Italian wine. I cooked off half the wine, added the local mushrooms, poured the mixture in a pan, put in the shanks, half submerged, covered it with tin foil and baked it for 40 minutes, flipped shanks, 40 more minutes, then uncovered for 15 minutes.. They were absolutely delicious and moist. And the vegetable mixture, mostly mushroom as the onion, garlic, and peppers have shank while I was cooking off the wine, was to die for. A bit too much rosemary in the vegetables, not in taste, but in number, as I had to pick it out, but very good. A good first go at it. This first experiment, and the process of getting to it, made me think of other, non-food related, ideas. Where does my clothes, my paper products, all the things I get come from? I went to Boulder to shop one day, and wandering around, I thought of all the focus that is put of fair trade and making sure products produces in other countries can be sold in the US at competitive prices, and how few places carry local products. There are quite a few Tibetan, Chinese, and similar stores in the Pearl Street Mall, and several fair trade stores selling imports from Africa and South America and the like, but only one store that focuses on local craftsmen and the like. It is easier to find products from across the world than those made right here where I live. Interestingly, the farmer's markets are a source for that as well. At the Longmont market are craft stands as well as the produce and meat and other food stands. This weekend, I made my second mostly local meal from the farmer's market. My plan is to do one each pay period, plus get as much local besides it as possible. The meat I picked out was a two pound flatiron cut of steak. A lot of meat for $12. In addition, I bought three ears of corn, four small red onions, a head of garlic, a bag of basil, and a bunch of cilantro. Total with the meat came to right around $20. The cilantro wasn't for this meal, but to use in tacos, and the basil was primarily for bruschetta. I heated up the grill. It's one of those no-fire George Foreman grills. While the meat thawed in water (ranches typically store and sell meat frozen), I cut up the onions, a few cloves of garlic, and some of the basil into a bowl. I added some of the wine from the week before, some olive oil, and some Worcestershire sauce, plus cayenne pepper, black pepper, and salt. I mixed it all up and let the flavours mix, then when the meat was close to thawed, I poured it into a pan and moved the vegetables to the sides, so that the juice would settle in the middle. I let ti drain a bit until it was about an eighth of an inch deep, and the meat was completely thawed and placed the meat in the juice. Let it marinate for a few minutes, flipped it over, let it marinate for a few more, then took everything out to the grill. I put the steak on, then dumped the vegetables on and spread them (this wouldn't have worked in a traditional grill, they would have fallen through), and put one ear of corn (which I had removed almost all the husk of, so only a thin layer still covered it) on. Every so often, I stirred the vegetables, rotated the corn (using the stem as a handle), and flipped the steak, pouring a bit more of the juice from the pan on it. I bet it took about fifteen minutes to cook everything. It all tasted wonderful. The thin parts of the steak were a bit over done, but the main bulk was perfect. I put butter and salt on the corn and ate it off the cob, absolutely perfect. And the vegetables were very good. 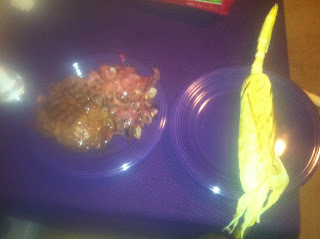 I ate all the corn, but only finished half of the steak and vegetables, putting the rest in the refrigerator. Was definitely a successful meal. Over all, it is progressing. I'm eating more local than I did before, even if not every meal. I feel more connected, and definitely more aware, because even what I don't eat local I think about that fact. And I add bits of local things in, herbs, honey, garlic. A few other things I've been considering. I'd like to gather local cat tails, and back flour from them to use in baking. I am contemplating a share in a farm next year, getting weekly or biweekly baskets of produce or meat. I'm considering making an arrangement with one of the local dairies that deliver, for my milk. I need to swing by the local butcher and see what they have for meat. I'd love to find a source for local flour, presuming the cat tail experiment doesn't work well. For my bruschetta this time, I'm going to make my own french bread, and I made banana bread yesterday and corn bread a few weeks before. If I can use local flour or can use cat tails, these breads would be a good way to eat local. Time will tell what all I end up doing, but the process and quest to eat more local is opening my eyes to what is around me in new ways and making me more conscious of what I put into my body. A really interesting post. I do as much local food as I can. We are lucky to have friends who raise chickens, spoiled, much loved chickens, and have all the eggs we can use - big difference in flavor, as well as energy - these are animals that are cared for and loved, not far from us by good friends. The same with produce. It does have a completely different feel and connection to the land. It seems odd that grocery stores would ship food from so far away when it grows right in their own backyard. For those closely connected to the Land, this is another way to make that connection, as you say. Have you thought about buying in bulk and preserving? Canning and freezing? I find a great deal of spiritual satisfaction in doing that, plus the additional benefit of having local food available later on. Besides freezing herbs, I haven't really. I'm not 100% at the moment what would preserve well that I use and what wouldn't, but I'm going to think about that and see what I come up with. Could be a very good direction to go. Thank you! Very interesting story! Where we are there is no famers market without an hours drive. But our chickens and garden provide us with all the eggs we eat, and 99% of the vegetables. We grow and dry a lot of our herbs, and I ferment hot peppers. The great part of being where we are is that I can start a vast supply of salad greens- lettuces and mustards and others from Wild Garden Seed (awesome resource) and Fedco (ditto!) in the late summer and early fall. Succession planting is viable until about November, and with simple cold frames dropped over the beds we have more fresh greens than we can eat until everything turns bitter in April. Summers are a bit more of a crap shoot- this year the weather did a number on the garden- but we still have enough summer squash, Tomatoes, and peppers for the two of us and a couple dozen delicata and butternut squash for the fall. You are in a great place for some kind of tunnel greenhouse- great light up there! Natural Grocers (previously Vitamin Cottage) stores have a lot of colorado foods and are also a Colorado owned company. All of their produce is organic and they have freezers of Colorado elk, and their herb and supplement section is awesome! We get most of our food there and the farmers markets here in Denver. Good luck with your quest for local food!